Order Informing Soul Technique™ DVD Course and Save 20%! One of them is the day that you are born. The other is the day you learn why you were born! The Informing Soul Technique™ uses hypnosis to enable a client to go before she was incarnated, back to her pure soul consciousness. Once in this state, the hypnotist can speak to the individual's soul and find out what is her purpose in life. Exciting News… Order Informing Soul Technique™ DVD course today and save 20%. This weekly special is for a limited time only. 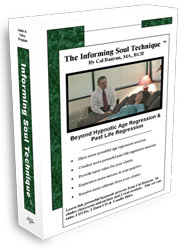 With the Informing Soul Technique™ DVD, you get everything you need to get started, including a step-by-step video tutorial on how to conduct these sessions, class handouts, and much more. If you would like to learn more or order this course, click here. Order today and save 20%! There is a short video there where Cal Banyan explains it all.